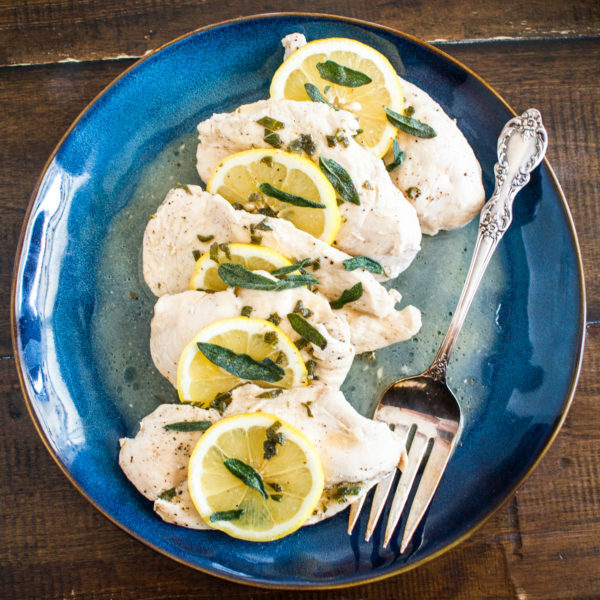 Lemon Sage Chicken is a no-fuss 15-minute recipe for chicken poached in a delicious lemon, sage, and white wine sauce. It is the type of thing that I whip up when I don’t know what to cook for dinner. I love an easy meal that is still elegant. 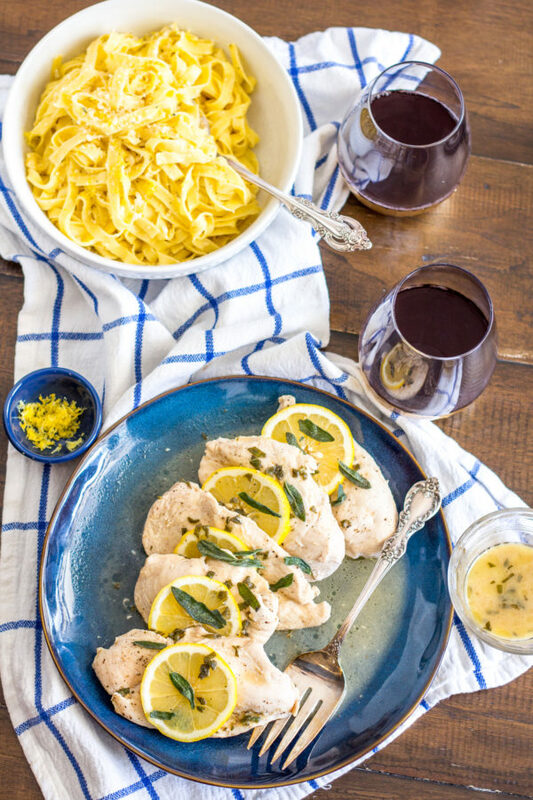 Lemon juice gives this chicken a bright fresh flavor and the chopped sage infuses into the poaching liquid and balances out the tartness of the lemon. 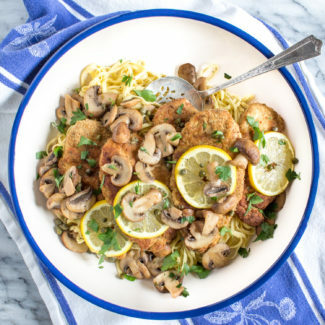 The method of preparing the chicken in a mixture of butter, white wine, and lemon juice makes it really tender, and the mixture reduces into a flavorful sauce. 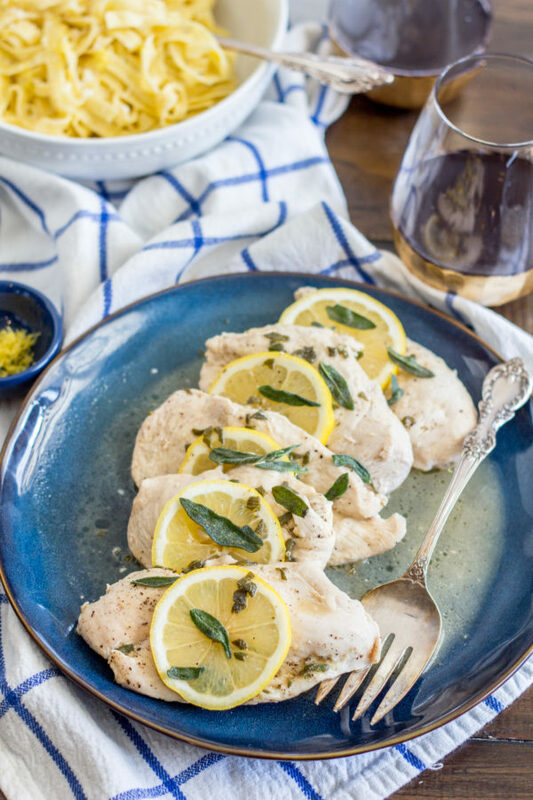 The process of preparing Lemon Sage Chicken is simple, you melt butter in a skillet, add the chicken, and then pour in the white wine, lemon juice, and sage. The chicken cooks in about 8 minutes, and then you remove the chicken and reduce the liquid into a sauce. 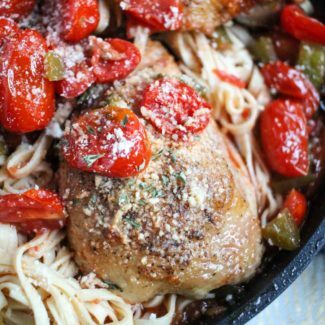 This is a one skillet chicken dish that is so easy to prepare that anyone could make it. 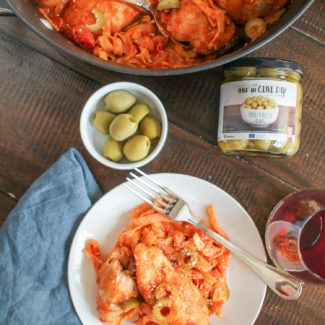 This meal comes together so quickly because I use thin sliced chicken breasts to prepare it. You can use full sized chicken breasts; you will just need to increase the cooking time so that the chicken gets cooked all the way through. 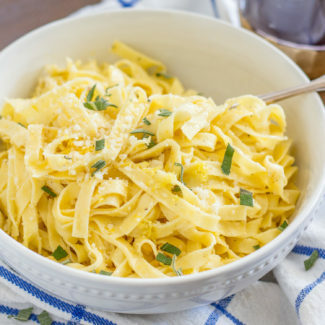 I like to serve Lemon Sage Chicken with Lemon Parmesan Fettuccine. 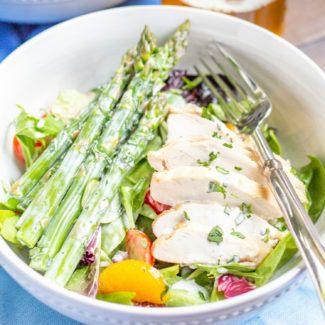 If you want a lighter option, the chicken would be a delicious addition to a salad. Or you could just serve it over a bed of raw or sautéed spinach. Sometimes I eat it over rice pilaf and I love how the rice soaks up the sauce. If you want a simple vegetable side dish, I love spicy roasted broccoli. If you want, you can add some fried sage on top as a garnish. It takes just a minute to fry up the sage and it is a nice little treat to add to the meal. You can use any white wine that you like. I used a Sauvignon Blanc, but a Chardonnay or Pinot Grigio would work too. 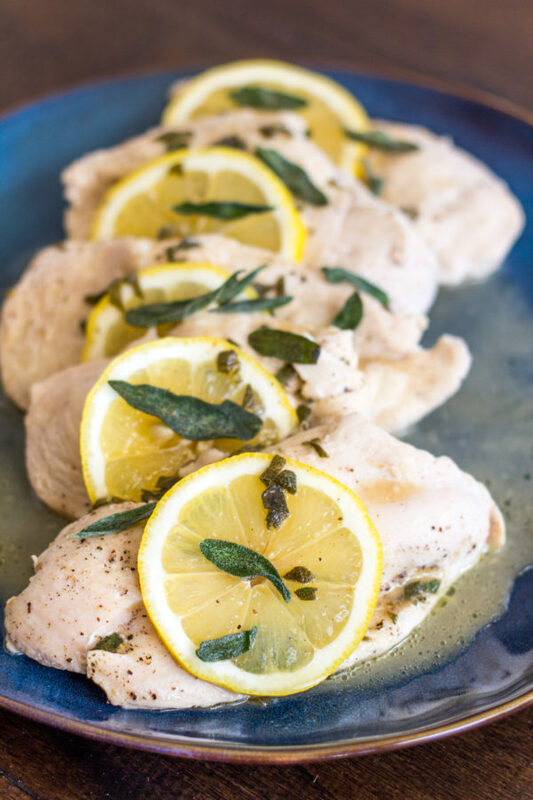 Lemon Sage Chicken is a no-fuss 15-minute recipe for chicken poached in a delicious lemon, sage, and white wine sauce. It is the type of thing that I whip up when I don’t know what to cook for dinner. I love an easy meal that is still elegant. 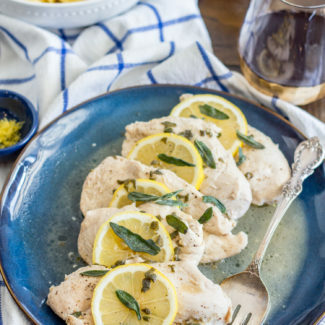 Lemon juice gives this chicken a bright fresh flavor and the chopped sage infuses into the poaching liquid and balances out the tartness of the lemon. Melt the butter over medium heat in a large skillet. Sprinkle the chicken with salt and pepper. Then place the chicken in the skillet. Pour the lemon juice, white wine, and sage over. You want the white wine to almost submerge the chicken, add more wine if you need to. Once you can see that the chicken is almost cooked through, flip it over. The first side will take about 4 minutes to cook. Once flipped the second side will cook in about 3-4 minutes. 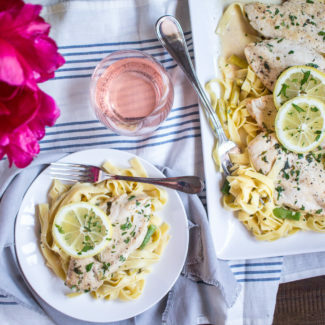 Serve the chicken with the lemon, white wine, sage sauce in the pan spooned over. If you want you can also garnish with some fried sage leaves. If you want, you can add some fried sage on top as a garnish. It takes just a minute to fry up the sage and it is a nice little treat to add to the meal. You can use any white wine that you like. I used a Sauvignon Blanc, but a Chardonnay or Pinot Grigio would work too.